My kids think these are hilarious. They play “ice cream shops” in the shower or outside they pretend feed their plastic babies ice cream. They have also used paint brushes and painted with it like watercolour paint. Fill each plastic cup up with shaving cream similar to a soft serve ice cream. I recommend using shaving cream for sensitive skin or organic shave cream. 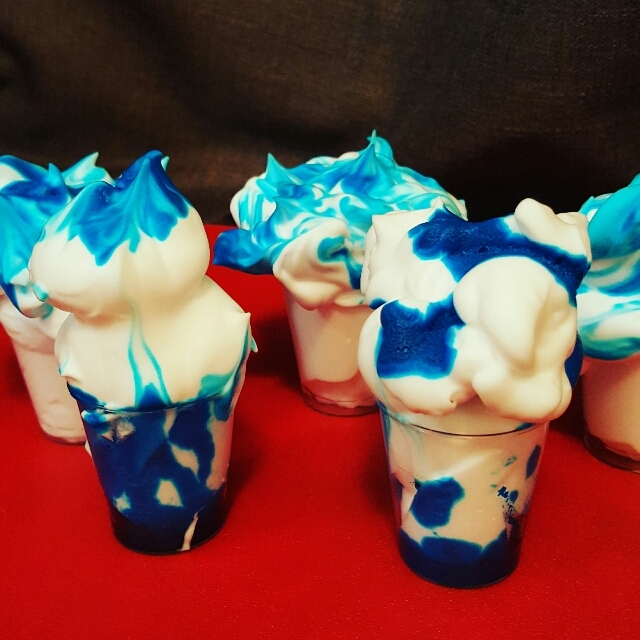 Put your food colouring in a bowl or cup and with a straw or spoon dip the end in and swirl it around the shaving cream. You can also put colouring in the bottom of the cup (see picture for variations). My toddler keeps playing Ice Cream shop with imaginary ice creams so this would be cool but I don’t think it would be a good idea with my 8 month old around. Yassssss. Best idea. My terrors will love having fun with this messy activity ! Thanks for sharing. good for imagination. Do they ever get tempted to eat them? Would be great for a rainy weekend – you get let the kids create ice cream shaving sundaes in the bath! Good Times, I gave them some paintbrushes a while back to paint on the shower tiles with it. Quick pray of shower cleaner afterwards got it off. they loved it. Great different way to paint. My kids will love this. Thanks for sharing. Reminds me of when I was a kid and my brother and I used old jar lids to make mud pies (out of mud). Silly but lots of fun. How unusual and how novel! kids will love this! I love this idea. Would be a fun bath activity.